of their treasured cultural and religious symbols disparaging and disrespectful. Many others who have looked at this issue concur. evaluate the progress on this issue. policy. In addition, many citizens wrote to us. basketball have avoided the use of Indian-themed names or mascots. that the use of these symbols should end. may not be aware that the statement heard can be contrary to the one intended. representatives do not share that view. that Native American observers would find distressing when used in that manner. involves a state responsibility as well. School Superintendent and they seem like a good place to begin. intended and how it is interpreted? unintentionally offend a member of the group’s religious or ethnic beliefs? used in place of the existing mascot? however unintentionally inflicted, these symbols cause. engage in focused, honest consideration of the issue. Nation and the curriculum coordinator for the Seneca Nation. emotionally one might feel that something important has been taken away. on the wall, and it is very clear. basis for the Commissioner’s direction. and of how it behaves toward people and groups. That process continues. knowledge makes it incumbent upon us to make it an issue now. cartoonish and they used sacred Native American symbols in denigrating ways. learned, the removal of another misrepresentation painted on a cafeteria wall. promoting understanding, and dispelling stereotypes in comprehensive ways? Could it honor rather than demean the culture from which it was taken? helping us understand this issue. go. Perhaps we should show them, given our mission of teaching young people. schools, we have to model it for our children consistently. hearts and minds as well. They are part of the bedrock of our district. basic human dignity and respect. system and a better society. Will they be the Bayhawks? The Eagles? Iron Eagles? The ultimate decision will fall to West Irondequoit Central School District residents. Beginning Nov. 1, they may cast a ballot in support of a name to replace the Irondequoit Indians moniker, which will be retired later this year. The district's Board of Education voted Aug. 23 to retire the Indians name and logo after a request to do so by Superintendent Glenn Wachter and pleas from members of the Native American community. District residents already had the chance to submit name suggestions, and Irondequoit High School student council representatives, along with a committee of district administrators, athletic personnel, alumni and community members, pared those suggestions to the following five: Bayhawks, Eagles, Iron Eagles, Pride and Raptors. Paper ballots for the vote will be available beginning Nov. 1 at all West Irondequoit schools and at the district's administration building at 270 Cooper Road. Ballots must be returned to the Irondequoit High School student council, 260 Cooper Road, Irondequoit, NY 14617 no later than 7 p.m. Nov. 14. Residents who do not vote by paper ballot will be able to vote in a voting booth from 4 to 7 p.m. Nov. 15 in the Connorton Gym at Irondequoit High School. The winning team name is expected to be announced Nov. 20, following verification of the ballots. The winning name is the West Irondequoit Eagles. next spring when the new name is formally adopted. address and phone number of the artist. for a new name on November 14 and 15. The school's traditional "Indians" will be succeeded by a new, patriotic mascot name. of a three-month-long process to select a new mascot for the district. it can be offensive to Native Americans. residents, and alumni voted on earlier this month. school in the district could vote," Irondequoit High School Principal Jeff Crane said. Iron Eagles with 652; and Pride with 423.
retired next spring. The new name will officially be adopted then. don't live in the district. "It doesn't make sense to me," she said. She did favor the Eagles name. Senior Angela Aratari voted for Eagles. so the mascot name still has something to do with Native American culture," Angela said. spokeswoman Teresa Werth said. "I think the new name has some interesting potential." ·  When combined with "Irondequoit," it has good word flow and reflects national pride. ·  Eagles are strong, grand, stately, rare, regal, and breathtaking. ·  Eagles symbolize power, fortitude, and success, both academically and athletically. ·  Their survival from near extinction speaks for itself. a result of the new name, he said. The district does not have the funds to replace uniforms all at once, Werth said. Crane said he heard some cheers outside his office door. to get used to," student council president Jamie Gentile said. patriotism of the symbol," senior Geoff Sanderson said. volunteers to "sign in" voters as he explained how the machine worked. "This is a good educational opportunity," Schockow said. Voters in just one 15-minute period were favoring all but one of the names. "I like Bayhawks because it sounds good," Emily Eckrich said. said, but none in the Monroe County League. "The closest one, I think, is Midlakes, which has the Screamin' Eagles," he said. Since Francesca and Geoff are both art students, each is considering submitting a design. Irondequoit High School art department, 260 Cooper Road, Irondequoit, 14617.
inches by 16 inches and should include the name, address, and phone number of the artist. Graphic artist Helen Barry of Irondequoit came up with the winning design. 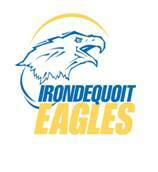 The Irondequoit Eagles now have a face to go with their new name. Graphic Design, 70 Kings Gate South. Barry's bold, crisp design of an eagle head, with the words "Irondequoit Eagles,"
During a fall vote that was a culmination of a search for a new name, "Eagles"
was chosen as the "Indians" successor. "But if it was up to me, we'd probably still be 'Indians,'" Barry said. face, then envisioned it in a kind of circle, Barry said. team uniforms, school planners and notebooks, and elsewhere throughout the district. director of athletics, Dennis Fries, said. He said he especially liked what he called the "fluid motion" of the design. go out until the end of April. "You won't find Eagles or the new logo on uniforms this year," he said. It certainly will be showing up on future athletes. "I've never done anything this widespread before, that will be around for a while,"
PTA. That logo features a star above all the names of district schools. seventh grader at Dake Junior High. chair of the PTA Reflections art contest. Barry's logo. The vote was unanimous. told the group he had assembled. it. You can't expect that right off the bat." impact," and was immediately recognizable and dignified, Werth said. The new "Irondequoit Eagles" name and logo will be formally adopted during a 7 p.m.
"Indians" name will also be respectfully retired at that time. but added, "and of course, all current IHS alumni will be 'Indians forever.'" West Irondequoit's name switch to Eagles becomes effective July 1.
logo and formal adoption of the new "Eagles" mascot and logo. "Indians," however, will still be used through the end of the school year. The "Eagles" name is effective July 1.
by initial remarks by Student Government President Jaime Gentile. will become the root, the heart of our school spirit." of Native American names, symbols, and mascots. the community in a vote last fall. the essence of honoring is listening and respecting." commended the school board for the action they took. athletic competition. A profile of a Native American is in the center. also talked about the legend and symbolism of the graceful bird. logo, a profile of an eagle with its beak open. made by Passantino Sports of Irondequoit. after July 1. Orders for both are now being accepted.